Let’s face it, no one expects Dubai to be a cheap city. Everywhere you turn you see over-the-top skyscrapers, exotic cars, high fashion, and glitz and glam. After all, Dubai exists for a single purpose: capitalism. If you’re not careful, the city will drain your wallet faster than an addiction to crack. There are no shortage of hotels in Dubai, and many of them are expensive. The average hotel stay in an attractive area of the city will often run you several hundred dollars per night. While there are a few budget hotel options sprinkled throughout the city, most of them will be farther out of the city center and you’ll end up paying a lot in transportation fees just to get anywhere. Rather than staying in hotel, rent an apartment (or room) through AirBnB instead! There are over 1,000 AirBnB options in Dubai. We rented a 1-bedroom apartment in the luxurious Dubai Marina for $56 per night. 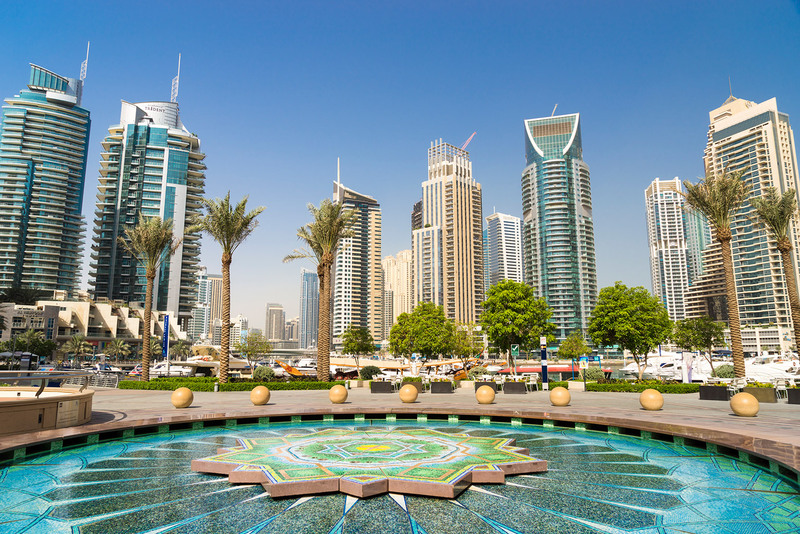 We were located in the “tallest block in the world” with easy access to the lovely marina promenade, dozens of restaurants, nearby grocery stores, and only a few minutes walk to the Dubai Metro and Tram. And if you sign up to AirBnB using this link, you’ll get $25 off your first stay: www.airbnb.com/c/dbjorgen. Yes, this was our neighborhood when we stayed in Dubai. While taxis are convenient and (usually) fast, they are also much more expensive than the public transportation options in Dubai. If time isn’t of the essence, take the Dubai Metro or bus system instead. The Dubai Metro is the first urban train network in the Arabian Peninsula and the longest fully automated metro network in the world. The metro currently has two lines: a 29-station Red Line which runs the length of the Dubai coastline from Al Rashidiya to Jebel Ali; and a 20-station Green Line that runs generally parallel to Dubai Creek. Dubai Metra stations and trains are air conditioned – a welcome convenience in the Dubai heat. The metro trains are efficient and orderly. The trains have 3 classes of accommodation: Gold class (first class), Women and Children class (designated by pink placards), and Silver class (economy). The cost per ride depends on the amount of zones traveled, but generally a single ride on the metro runs 3-5 AED ($0.82 – $1.36). Compared to a fare of $8-$10 in a taxi for the same distance, it’s quite a bargain. 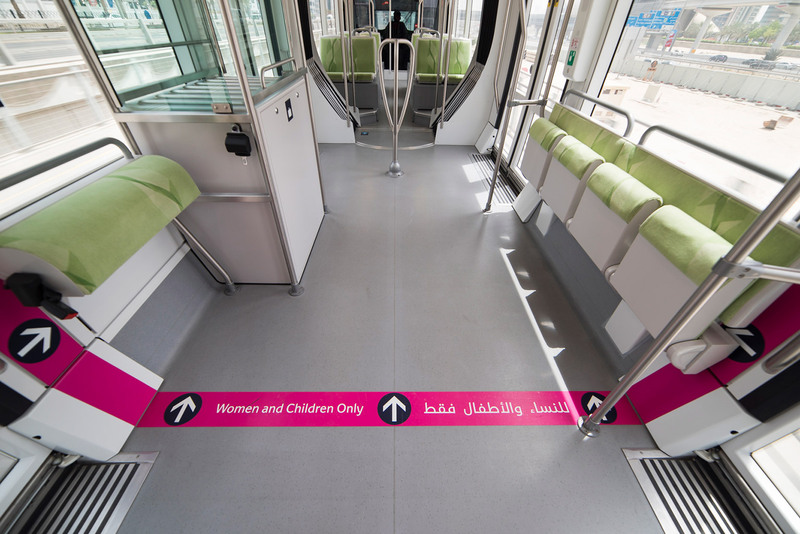 Women and children metro cars can be identified by their pink placards. Steep fines can be administered for those riding in the wrong class. 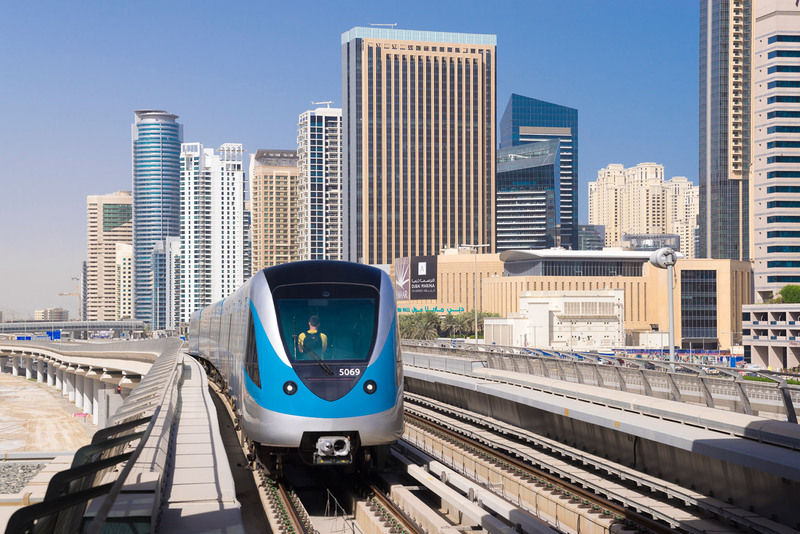 In addition to the Dubai Metro, public transportation services also include an extensive bus system, and the Dubai Tram, which is a slow but steady system that runs along Al Sufouh Road to the Dubai Marina and beachfront. Fares for the Dubai Metro, Tram, and bus systems are paid through a renewable Nol card, which can be purchased at any Dubai Metro station. Meals, like every other cost in Dubai, can add up quickly. Be aware that practically any meal in the city center is going to be pricey, even if you’re trying to do fast food on the cheap. Less expensive eats can be found in local dives along Dubai Creek or farther afield away from the city center. Even in the affluent areas grocery stores can be found aplenty. Preparing your own meals is much cheaper and healthier than dining out. Smoking the hookah (also known as a water pipe, arghileh, or shisha) is a popular social pastime in Dubai. Plenty of coffee shops offer hookah, but at a steep price. A single water pipe session can cost upwards of $20. While it may be worth it to try the hookah once for cultural and traditional reasons, try to avoid multiple sessions if you want to survive Dubai on a budget. There are certain activities and experiences in Dubai that are worth spending a little extra money. Go skiing at the Mall of the Emirates. Take part in some water sports or parasailing off Jumeira Beach. Visit the observation deck of the Burj Khalifa, the tallest building in the world. 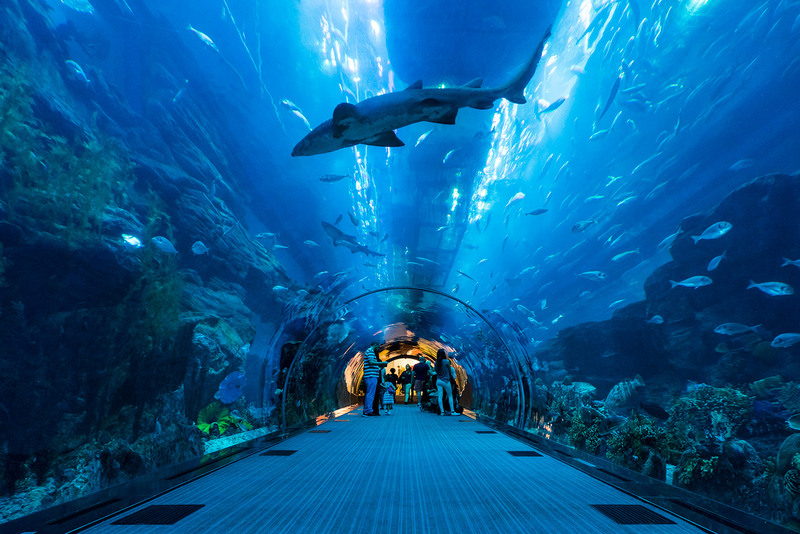 Visit the Dubai Aquarium in the Dubai Mall. Play with the dolphins at the Atlantis Water Park. Or soar high above Palm Jumeira with Skydive Dubai. After all, Dubai is one of those cities where you can’t have fun if you don’t spend a little money. Underwater tunnel at the Dubai Aquarium. Have you ever been to Dubai before? 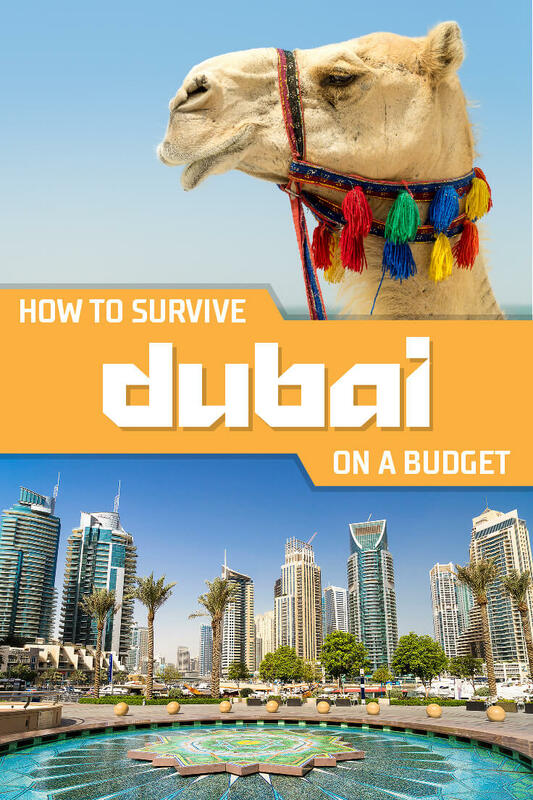 What are some of your tips for surviving Dubai on a budget? Please keep me informed on all things Dubai.